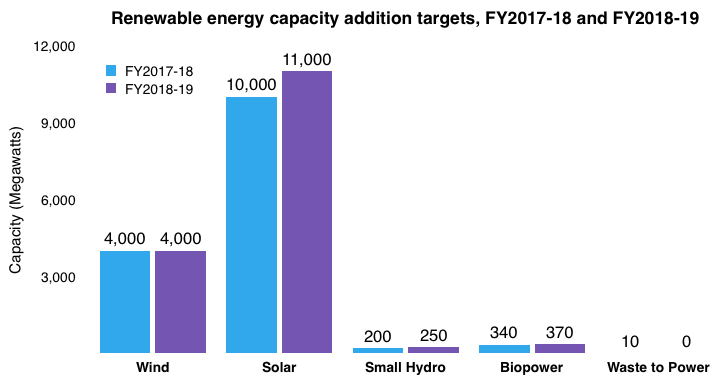 In a very encouraging news, India has achieved a milestone 20 GW in cumulative solar installations that was set for 2022, four years in advance. The target of 20 GW by 2022 was originally set in National Solar Mission. However, the current NDA government had scaled up the target to 100 GW of solar capacity by 2022. Going by the rate of capacity addition, even this target seems achievable now. As on 30th November, 2017, the total installed capacity of electricity in India was 330860.6 MW out of which 18 per cent was from renewable energy sources. Between March, 2016 and December, 2017, the installed capacity of solar power increased from around 6.8 GW to 17 GW. According to the latest India research report by green energy market tracker Mercom Capital, the utility-scale cumulative installations now stand at approximately 18.4 GW, with rooftop solar accounting for another 1.6 GW. The top states for solar installation were Telangana followed by Karnataka, Andhra Pradesh and Rajasthan. After a great year in 2017, the pace of overall solar installations is likely to be less impressive in 2018 as several protectionist policies appear poised to increase costs and uncertainty. The recently announced 70 per cent preliminary safeguard duty recommendation, the ongoing anti-dumping case and a 7.85 per cent port duty on imported modules have created an atmosphere of regulatory uncertainty that is taking a toll on the industry and slowing down installation activity – the Mercom report quoted CEO Raj Prabhu as saying. Private solar companies in India have gained vital experience over the years and are looking at the government to create an environment conducive for growth and remove the policy uncertainties that plague the industry. Solar power policies including Net-Metering, Open – Access are variable across the states, there is no parity. Additionally, implementation of these policies at ground level has also been a challenge. Another problem the sector faces is that state electricity utilities and distribution companies (Discoms) across India aren’t supportive as it could hurt their finances. As more commercial and industrial users, who bring the maximum revenues to state discoms, take to solar power, the revenues of electricity generators and distributors would fall. With all these factors into account, Mercom Communications India, has forecasts that total installations to fall by 22% year on year to approximately 7.5 GW in 2018. Whatever the case is, India has long way to go for solar as The National Institute of Solar Energy’s study indicated that the country has the potential to generate 748.98 GW of solar power.